Looking for a place to stay in Amsterdam? You have found it! Amsterdam is a great city to visit, whit breathtaking sights, a never-ending nightlife, museums, arts and great shopping and business opportunities. 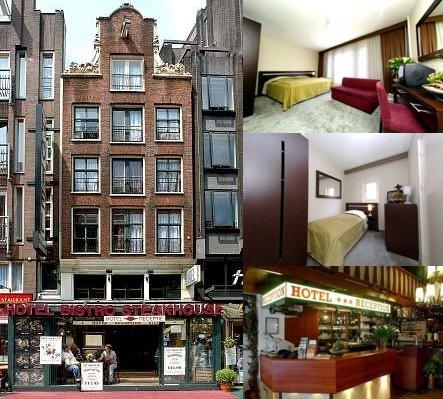 Hotel “De Korenear” is a typical Dutch tree star hotel, centrally located on Damrak, Amsterdam's main avenue, close to many attractions. Walking straight across the street there are many touring boats so you can go on a tour on the famous canals. Within walking distends you find the Dam, the flower market and the famous Rembrandtplein with all his pups and clubs. Whit the tram you are within five or ten minutes from all well know museums, Anne Frank house and the Heineken Brewery. Our thirty rooms have been completely renovated in 2004 and the hotel is easily accessible by car or public transport. Breakfast is included in your rate and is served between 7:00 AM and 10:00 AM. The hotel features a Dutch Steak House with a bar open 8:00 AM to 1 AM. Our hotel guests benefit of a 10% discount on all meals. The reception of the hotel is on the ground floor and is open twenty-four ours, so we can advise you, to make your stay as good and pleasant as possible. All our rooms offer a private shower and toilet, cable television, telephone and a private safe. On request we can provide you an iron or hairdryer. We look forward to make your stay in Amsterdam a pleasant experience.